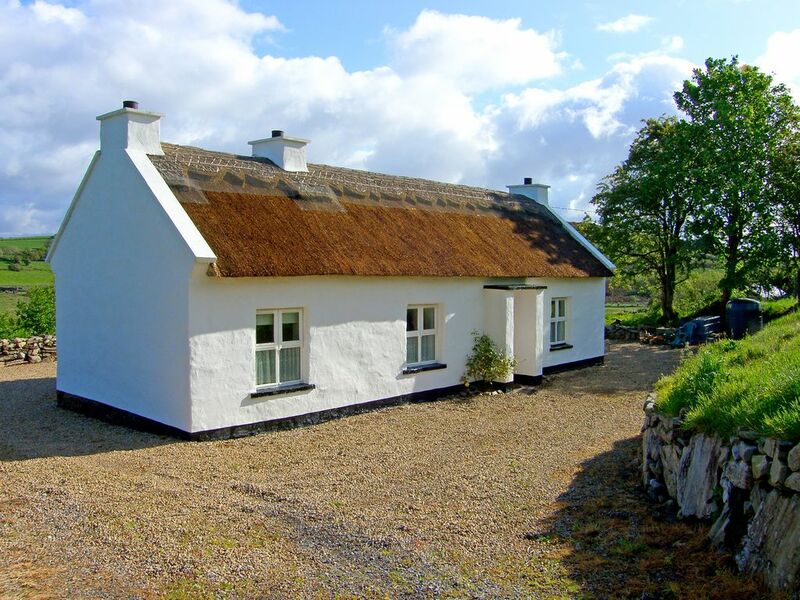 This 400 year traditional thatched cottage has recently been restored to its old charm. Set in a peaceful and secluded location, the property is set on 10 acres of Forest land ideal for walks and yet is just 3 miles from Ballyshannon one of the oldest towns in Ireland. The property has been comfortably furnished to accommodate all your needs and has the luxury of an open fire for a cosy night in with a glass of wine. The village of Cashelard is just 1.5 miles from the property and has a pub and shop available, there is a large array of pubs and restaurants to choose from. The property is in an ideal location for touring Donegal and makes for a relaxing holiday.Shop. Pub 1.5 miles. Restaurant. Beach 4 miles. GF: lounge/kitchen/diner, 2 doubles, shower room.Electricity and oil central heating included, open fire with starter pack, linen and towels included, travel cot, high chair, TV, dvd player, CD, fridge with small ice box, microwave, washer/dryer, freeview, welcome pack, decked area, garden furniture, bbq, off road parking. Pets welcome. We wanted to stay in an original old Irish cottage and this was perfect. Wonderful, quiet, and peaceful place to stay and close to major roads for all of north exploration. Cottage was quaint and cozy. Had oil heat and fireplace to take chill off in the evenings. Location was very quiet and "away from it all", yet only 15 minutes drive to town. Kitchen was well equipped and bed was very comfortable. We did walks in the evening right from the cottage door. A great place to stay to explore County Donegal and cross the border into North Ireland.